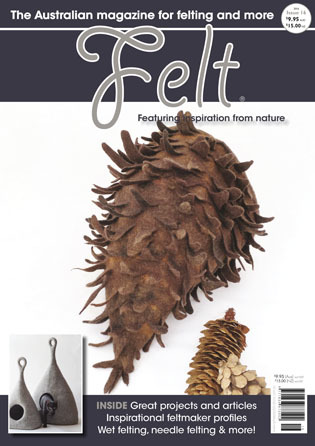 Felt Magazine aims to inspire fibre enthusiasts with incredible artist profiles, technical articles, a gallery of creations by different felt artists, and great projects and techniques to try. Techniques include: wet felting; dry felting (including needle felting – by machine or hand); further embellishment using many techniques including hand or machine embroidery. For more information on contents of this issue click on “Description” below. Published December 2016, this great magazine is published each June and December. Want to Subscribe? Subscribe for 12 months HERE or 24 months HERE. Subscriptions will start with the next issue out so that we don’t double up on one you may have purchased already – please refer to the subscriptions page for clarification. The price includes postage and handling within Australia – International purchasers pay postage at checkout.